Colonial Towel Rail Shelf - Grey. Wall-mounted furniture is always a good choice in bathrooms, where floorspace is at a premium; this smart shelf is designed to accommodate fresh folded towels, as well as featuring a rail to air towels that are in use. 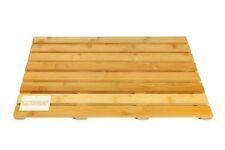 Woodluv Luxury Expandable Bamboo Bath Bridge Caddy Shelf Rack Tub. Woodluv 100% Organic Full Willow Handmade Two Tone Oval Log Basket with Linning. Simple yet elegant shape and sturdy contrast color legs, this Towel rack is a great way to brighten up empty space in your bathroom. It also features an elegant design, which is functional and a durable piece of furniture for the bathroom. 4, Straightforward. 2, Easy and convenient. 1, Safer and more protected. You do not have to give any reason for cancellation. Bought these for myself, but decided the colour was too dark. 2 x 50 cms x 80 cms. Bamboo Ladder Great for hanging towels, displaying clothes or anything else you'd like to display. 1500x550x60mm. Natural bamboo towel rail ladder. Good condition. Looks lovely. The Premier Corner Vanity Unit with Basin 550mm Wide - 1 Tap Hole is a product manufactured by Premier and identified by the Manufacturer Part Number: NVC180A. ✔ Basin Type - Inset Countertop. ✔ Projection (Unit Basin) - 395mm. Woodluv Bedside Drawer with Shelf Cabinet Side Table Storage Unit. 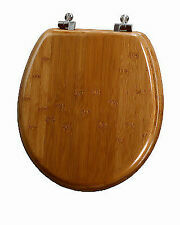 Very Durable: High Grade High Strength Bamboo which has been sourced naturally has been used in its construction. The bridge has then been finished in white making it a universal product for all decors. This unique and stylish design 3 bar bamboo towel rack is a the perfect accessory for your bathroom. Sports & Exercise. 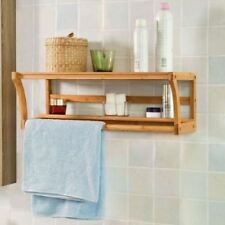 3 Bar Bamboo Towel Rack . Features 3 Rails. Floor Standing. Storage Boxes. This is collection only listing or you can book your own courier if you like. Cheapest postage is with Hermes for £20.00 Bamboo ladder shelf/towel rail holder. This is brand new boxed unopened item. Perfect for shelving, also can be used as a towel holder or perfect for decoration. Comes with wall fittings. Offers are only accepted when you want to buy 2 or more items. Measurements are following: 171.5cm lenght 28.2cm top width 43.6cm bottom width 6.8cm thickness Can be delivered around birmingham area for a charge. I have 3 of these unopened so if you wish to buy mkre than 1 then send me a message. Any questions feel free to ask. Bathroom storage. Modern White Gloss Bathroom Furniture Range. Excludes Channel Islands, Isle of Wight, Isle of Man, Scilly Isles, Scottish Highlands, Scottish Islands, Northern Ireland. Grey Gloss Bathroom Furniture Range. Now there's no need to be reaching when in the bath, with this bamboo bathtub shelf, your Soap, book, e-reader, Tablet, iPad, wine glass, cell phone, or whatever else you need can be in easy reach without fear that it'll actually fall into the tub. Useful shelf: Organise bathroom utensils like shower gel or shampoo - A book or glass of wine can also fit on the spacious caddy. For standard bathtubs: The length of 70 cm fits all standard-sized bathtubs - Simply lay it over the tub and enjoy the practical tray function. For standard bathtubs: The length of 70 cm fits all standard-sized bathtubs - Simply lay it over the tub and enjoy the practical tray function. Useful shelf: Organise bathroom utensils like shower gel or shampoo - A book or glass of wine can also fit on the spacious caddy. It has many smart designs, such as the wine glass holder, phone placing holder and book holder. When you are taking a bath, you could enjoy your wine, play your phone and read your favorite books, then you will feel really comfortable and relax. The VeeBath Linx Corner Basin Vanity Unit Cabinet by Bathroom4Less improves the eminence of your bathroom by adding a subtle touch of freshness and purity. The sturdy sink that is fitted on top of this furniture allows effortless washing activities without compromising on the contemporary design. New listingNEW TAVISTOCK ARRAY 600MM OPEN WALL MOUNTED UNIT - DARK JAVA AOU600DJ - SALE!!! The Array Open Unit in Dark Java is a stylish wall mounted unit that will transform any bathroom or en-suite into a focal point. The contemporary design and versatility of the Array range allows for a collection of drawers and units to be combined together in a variety of ways to create the option you are looking for in a bathroom unit. The dual texture and special bamboo fabric promotes silky soft skin that glows with health and turns a washing routine into a new experience. The textured bamboo side gently exfoliates and massages the face and body, boosting circulation and improving skin tone. 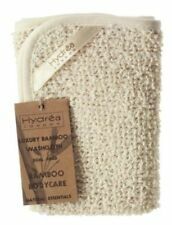 H 93 x w 76cm x D 35cm Bamboo towel rail. Collection is from Basingstoke Hampshire. Cooke & Lewis Bamboo 1 Lever Top mount basin mixer tap RRP £109. Condition is Used as installed and wife then decided she didn’t like it. Fitted to sink for one day max. All parts present but I can’t find instructions to fit sorry. Comes with pop up waste that is unused. This wall-mount shelf with an integrated towel rail will provide ample storage room in even the smallest of bathrooms. 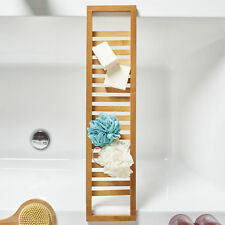 The wall rack is made of natural bamboo for a warm wooden flair for any bathroom. Channel Islands, Isle of Man, Isle of Scilly, Isle of Wight, Scottish Isles, Scottish Highlands and N.Ireland, Republic of Ireland. This cabinet has an elegant design, which is functional and a durable piece of furniture for the bathroom. New listingNEW TAVISTOCK ARRAY 300MM OPEN WALL MOUNTED UNIT - DARK JAVA AOU300DJ - SALE!!! Product Code: AOU300DJ. 300mm Open Wall Mounted Unit. Unit width: 300mm. The key to the contemporary modular Array range is its flexibility. The options differ from the single wall hung basin unit with or without open storage, to a luxurious 1200mm 4 drawer 'his & hers' design. 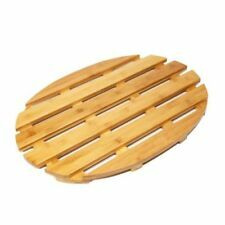 1 x Bamboo Bathtub Rack(Accessory not included). Supporting rack slope is 3 level adjustable. Books, wine and food can be placed on it for convenient. If you are satisfied with our service, pls. Width: Approx.